Rewards Canada: March 15 Update: The Ultimate "I have no idea what travel rewards I want" Credit Card portfolio and lots more! March 15 Update: The Ultimate "I have no idea what travel rewards I want" Credit Card portfolio and lots more! You can check out the updated chart here. There is a Best Western Rewards Elite Status upgrade that can come with one stay in Central Europe. We are not sure if it is limited to residents of that area so we didn't add the offer to our BW Rewards page but thought we'd still give it a mention just in case you have a stay in the region coming up and wanted to give it a try. We did post it on our global site of course where you can find the details of this offer. 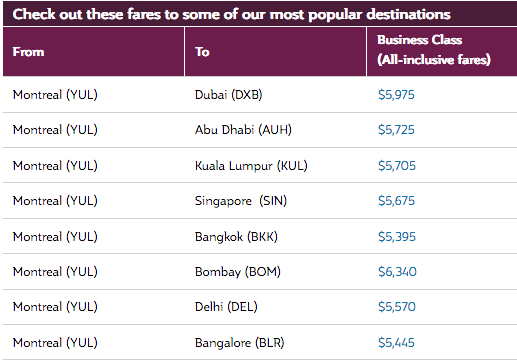 Qatar Airways has a new business class seat sale for their flights out of Montreal. Book by Mar 19 for travel until Jun 30. Find out more here.